By studying the hydra, a member of an ancient group of sea creatures that is still flourishing, scientists at UC Santa Barbara have made a discovery in understanding the origins of human vision. The finding is published in Proceedings of the Royal Society B, a British journal of biology. Hydra are simple animals that, along with jellyfish, belong to the phylum cnidaria. Cnidarians first emerged 600 million years ago. 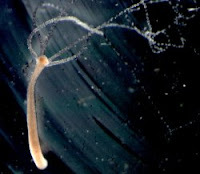 "We determined which genetic 'gateway,' or ion channel, in the hydra is involved in light sensitivity," said senior author Todd H. Oakley, assistant professor in UCSB's Department of Ecology, Evolution and Marine Biology. "This is the same gateway that is used in human vision." Oakley explained that there are many genes involved in vision, and that there is an ion channel gene responsible for starting the neural impulse of vision. This gene controls the entrance and exit of ions; i.e., it acts as a gateway. The gene, called opsin, is present in vision among vertebrate animals, and is responsible for a different way of seeing than that of animals like flies. The vision of insects emerged later than the visual machinery found in hydra and vertebrate animals. "This work picks up on earlier studies of the hydra in my lab, and continues to challenge the misunderstanding that evolution represents a ladder-like march of progress, with humans at the pinnacle," said Oakley. "Instead, it illustrates how all organisms –– humans included –– are a complex mix of ancient and new characteristics." CAN WE DETECT QUANTUM BEHAVIOR IN VIRUSES?